Along the banks of the Five Mile River in Rowayton, CT sits a fabulous airy and spacious newly constructed home with a natural beach toned feel. 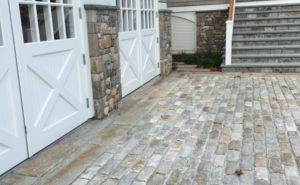 To compliment the architecture of this home, 150 year old jumbo big dig cobblestones that were taken from a reclamation in Troy, New York were chosen as driveway material. 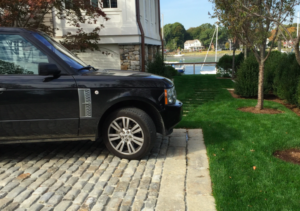 These reclaimed cobblestones not only stand out with a pretty big “wow factor”, but also seamelessly blend this home cohesively into the landscape and backyard waters edge. Naturally present, is the worn patina and smoothness that you simply cannot get with new cobblestones that exist on the market today. These reclaimed cobbles are so smooth you actually want to reach out and touch them….just like a smooth beach pebble! In addition to the reclaimed cobblestones, reclaimed granite curbing was used to create the banding effect you see here. In its past, this material has been used for hundreds of years to separate street from sidwalk. 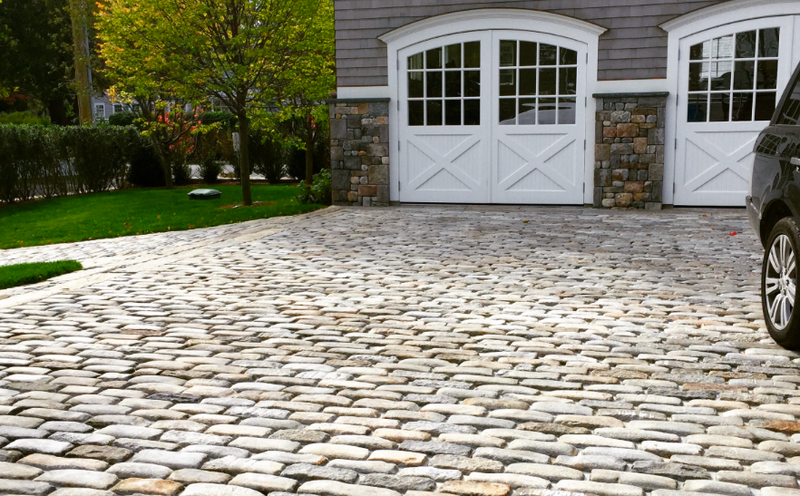 The curbing was a perfect compliment to the cobblestone’s aged patina. Reclaimed granite curbing creates the banding effect here. 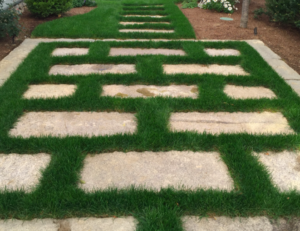 Reclaimed curbing with a view: This material was a natural choice for the edging! As a final architectural touch, reclaimed Asian planks were used to enhance and tie in some of the smaller aspects on this property such as the side yard, space near the front stairs as well as the backyard stairs that lead off the back porch to the boat dock. Reclaimed Asian Planks were used to enhance the side yard. We have more reclaimed cobblestones where these came from and are happy to discuss many of the endless project possibilities. 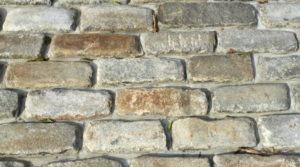 The beauty of reclaimed stone also exists in its versatility and ability to blend in with both antique and modern settings.